The German-based Doll + Leiber GmbH is specialized on logistics planning software solutions, and offers forwarders and hauliers a software portfolio for intermodal transport which can be deployed internationally, particularly for overland transport. The core element of their solution is called intertrans, a transport management software package. Around 220 customers use this software, a solution that covers the entire value-creation process of a transport chain. Together with dispoplan, which is a graphic scheduling module and the professional vehicle fleet management module (fleetmanager), the company offers a complete and comprehensive solution for transport. dispoplan takes care of the whole fleet including towing vehicles, trailers, swap body platforms, containers, but also drivers, equipment features, servicing schedules and opening times. The software provides comprehensive coverage of fleet operation processes. 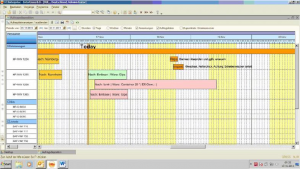 Earlier this year, Doll + Leiber decided to enhance dispoplan with advanced interactive Gantt chart functionality and decided for VARCHART XGantt from NETRONIC. This week, they released the new version and announced it to their customers and the German press. The respective (German) press release with some very endorsing statements regarding the quality and the user experience of VARCHART XGantt can be found here.